Whenever we go to the Beach there is always one thing we must do, take the girls to play putt putt golf! We drive by and the places are always packed. There is one on almost every corner (and yes they are all packed). They are so much fun though it is worth the wait and we enjoy it because it is something for the whole family that doesn’t break our pocket books. We have loved living in Auburn because we have many fun activities to choose from for the family. 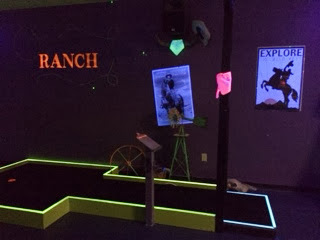 One of our favorite finds is right next door in Opelika (only 10 minute drive) and yes it is an INDOOR putt putt golf, Scutter Putters Mini Golf & More! 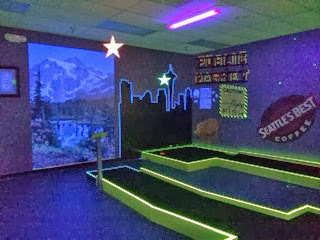 Yes I said indoor putt putt, 18 holes with music, games, black lights and more. Each hole is a fun place like the Ranch at Texas or Washington D.C., and the first hole is even Opelika, AL. 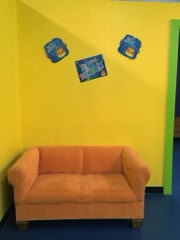 Not only is it close to us (but did I mention it’s indoors) making this is great for anyone who is looking for a fun place on rainy or cold days and even hot summer days! This is also a great place for BIG groups….Our homeschool group planned a field trip for us here, they host Birthday party’s and Church Youth groups. Located in the USA Town Center in Opelika around the corner from Cracker Barrel. The course theme is “Journey Across America”. Each one of our 18 holes is a place of interest or historic landmark located in the U.S. ranging from the Golden Gate Bridge and Redwood Forest to Carlsbad Caverns and Cap Cod. Every night is Black Light Night. Wear your best glow in the dark clothes and accessories and putt to the sounds of today’s hits. Scutter Putters Mini Golf provides a unique service to the community, they are family friendly and affordable . Also from a practical standpoint, the indoor facility allows a fun environment even when the weather is uncomfortable outside. 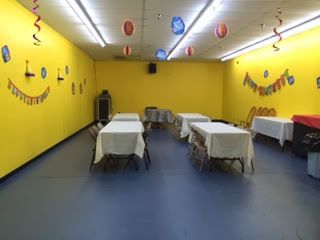 They provide a huge area for Birthday Party’s and is the best deal in town! So if your looking for a fun family outing or somewhere to take your large group be sure to check out Scutter Putters Mini Golf & More!